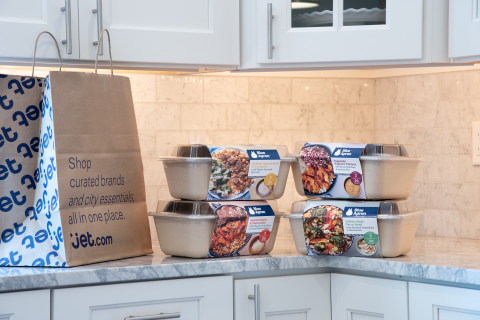 NEW YORK--(BUSINESS WIRE)--Blue Apron Holdings, Inc. (NYSE: APRN), known for delivering incredible meal experiences, has tapped Jet to be the first e-retailer to offer an assortment of its meal kits for purchase on Jet’s online and mobile platforms. Beginning today, millions of households across most of New York City, as well as Jersey City and Hoboken, can access Blue Apron through same-day or next-day delivery via Jet’s City Grocery offering. Note: A $5.95 scheduling fee applies. Only in select NYC area zips & subject to availability. See jet.com/citygrocery for day and cutoff time restrictions. This press release includes statements concerning Blue Apron Holdings, Inc. and its future expectations, plans and prospects that constitute "forward-looking statements" within the meaning of the Private Securities Litigation Reform Act of 1995. For this purpose, any statements contained herein that are not statements of historical fact may be deemed to be forward-looking statements. In some cases, you can identify forward-looking statements by terms such as "may," "should," "expects," "plans," "anticipates," "could," "intends," "target," "projects," "contemplates," "believes," "estimates," "predicts," "potential," or "continue," or the negative of these terms or other similar expressions. Blue Apron has based these forward-looking statements largely on its current expectations and projections about future events and financial trends that it believes may affect its business, financial condition and results of operations. These forward-looking statements speak only as of the date of this press release and are subject to a number of risks, uncertainties and assumptions including, without limitation, the Company’s anticipated growth strategies; its ability to execute on its multi-product, multi-channel growth strategy; the success of its partnership with Jet.com; its expectations regarding competition and its ability to effectively compete; its ability to expand its product offerings and distribution channels; its ability to cost-effectively attract new customers, retain existing customers and increase the number of customers it serves; seasonal trends in customer behavior; its expectations regarding, and the stability of, its supply chain; the size and growth of the markets for its product offerings and its ability to serve those markets; federal and state legal and regulatory developments; other anticipated trends and challenges in its business; and other risks more fully described in the Company’s public reports filed with the U.S. Securities and Exchange Commission (the “SEC”), including under the caption “Risk Factors” in the Company’s Quarterly Report on Form 10-Q for the fiscal quarter ended June 30, 2018 filed with the SEC on August 2, 2018 and in other filings that Blue Apron may make with the SEC in the future. Blue Apron assumes no obligation to update any forward-looking statements contained in this press release as a result of new information, future events or otherwise.